Confession: I often go to bed with wet hair. I know, terrible right?! Background: I have thick, long hair and it can take an excruciating amount of time to blow my barnet. But recently I've stocked my shelves with a handful of blow-dry products and whilst they don't replace a professional blow out, they reduce blow-dry time and make the blow-dry process a little less painful. Pre blow-dry using the nifty pump dispenser I take the pearly cream and use sparingly through the mid-lengths of my damp hair. This clever product from Redken perfectly primes my hair by speeding up the blow-dry process all whilst protecting my hair from damage. 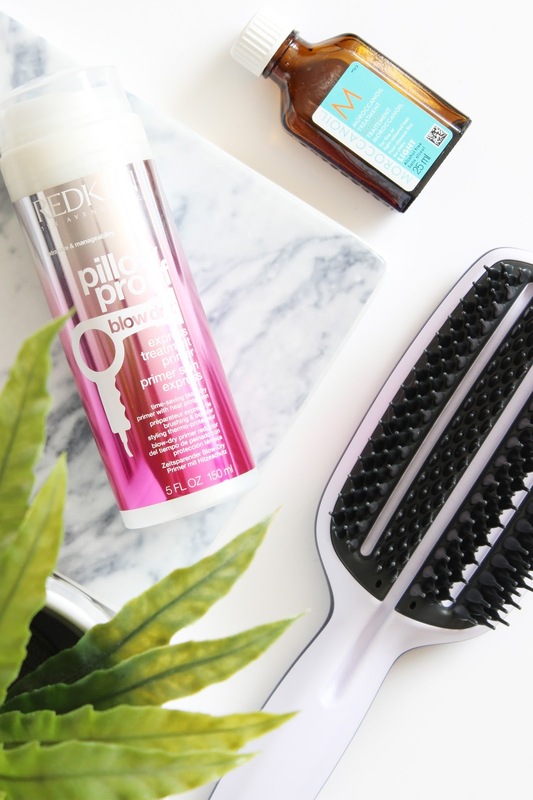 I find the formulation is far superior to the likes of Redken's Pollow Proof Blow Dry Express Primer Spray, which has the tendency to leave my hair a little crunchy. The formulation of the primer cream isn't sticky and leaves my hair soft and tangle free without a hint of crunchiness. It's also a great multitasker as it provides heat protection and it smells uh-mazing! This primer treatment from Redken is suitable for all hair types and is perfect if you're on a budget. Round brushing my hair is a trick I'm yet to master and maybe best left in the hands of a pro - you'll sympathise with me if you've ever got your hair stuck in a round brush! But this innovative paddle brush from Tangle Teezer makes the process much more manageable for those of us with medium to long hair. And whilst it does take a little getting used to, when used right it delivers on its promise cutting blow-dry time with its quick-drying teeth that 'rapidly extract surface water from the hair shaft'. I personally reach for this brush over the likes of my Original Tangle Teezer when blow-drying my hair, as I find it easy to keep the blow dryer moving constantly with the brush without pulling or yanking on the hair. The end result is smooth and straight hair without the use of straighteners. My only minor complaint would be that the brush is a tad heavy and the plastic teeth are very rigid, so be careful when using the brush at the top of your head. It may cost a pretty penny for just 25ml of Moroccanoil Treatment, but a little goes a long way and the fact I've repurchased this product time and time again is testament to just how good it is. Worked through damp hair avoiding the roots before I blitz with my dryer, this high quality oil infused with antioxidant rich argan oil and vitamins, not only cuts blow dry time, also eliminates frizz, restores shine, straightens and leaves my hair soft to touch without weighing it down. It's also the perfect product to pop in your bag when jetting off on holiday, as not only does it finish and condition it protects against environmental damage thanks to the UV protectors in the argan oil. What products do you use for a quick blow dry?